Earth - The not-too-distant future...A city is miraculously reborn just sixteen years after being completely destroyed by a giant meteor. Our story begins in the prestigious Graviton High School for Girls, nestled in the suburbs of the booming metropolis, as the English teacher, Miss Ayumi, introduces two new students - A-ko and her ditzy sidekick, C-ko. A-ko is a lively seventeen-year-old, no different from any other...Except for the fact that within her diminutive frame lies a strength that can only be described as superhuman. The trouble begins when B-ko decides she wants something, heaven help anyone who stands in her way. Unless that anyone is A-ko. B-ko becomes the irresistible and A-ko the immovable object as the action explodes across the unsuspecting city. B-ko goes up against the invincible A-ko with her arsenal of powered robot-suits, including the most powerful of all "Akagiyama 23." Meanwhile, a monstrous alien spaceship plies its way toward Earth in search of...? What is the connection between the girls and the alien ship? Who is the mysterious "D"? What is the secret of A-ko's power? What dark past fuels B-ko's rage? Why is C-ko such a space-case? 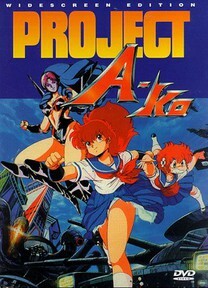 PROJECT A-KO is Japanese animation as you've never seen it before!